Okay. So you’ve decided to embark on the journey of incorporating seafood into your diet. Congratulations! There are hundreds of delicious recipes out there, but we’re going to give you a few solid starting points and the tools to explore at your own pace. Tuna salad is probably the most common and beloved of quick-and-easy seafood recipes. Not only is it a classic, but it can be tweaked and altered however your imagination sees fit! Your family probably has a classic recipe they swear by, or for a fresh twist you can try our Curried Cashew, Apple and Tuna Salad recipe. 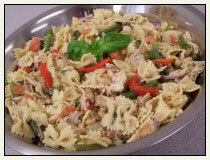 You can also mix tuna into a pasta salad to create a more complex flavor and texture while adding protein. Our recipes for flavorful Tuna Pasta Salad and Grape, Walnut and Tuna Tortellini Salad were built from the ground-up with tuna in mind. In addition to tuna salads and pasta salads, canned seafood lends itself beautifully to what we’ll call, for lack of a better term, “salad salad.” You know, with vegetables! 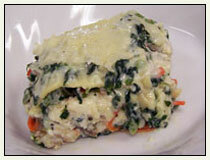 We’ve come up with almost a dozen such recipes, from Creamy Caesar Tuna Salad to Smoked Salmon, Asparagus & Avocado Salad. Yum! Seafood isn’t just for salads, sandwiches and appetizers. Canned clams, salmon, crab and tuna certainly have what it takes to play a more central role in your meal. Take soup. 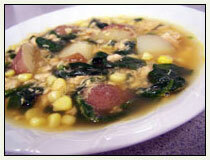 Why not start by trying something simple and classic like Cheesy Clam Chowder? Then branch out: try our light and veggie-laden Spring Salmon Soup in the spring and our hearty, flavorful Tuna, Pepper and Potato Soup in the fall? Finally, the main event: the main dish. We have so many beloved recipes in this category that it’s hard to tell where to start! If you’re a seafood beginner, pasta is a ‘safe’ place to start, such as our tasty Lemon Linguine with Salmon, easy-to-make Tuna Alfredo Pasta and delicious Four-Cheese Seafood Lasagna. We’ve linked you to more than ten recipes here, but there is so much else out there, from casseroles and puff pies to quiches and tortillas. And we didn’t even include any appetizers! If you want to search for seafood recipes that we’ve tried and tasted ourselves, check out our Seafood Recipes page, shown above. As you can see, you can search for recipes by fish or by dish type. And once you try one, let us know what you think via any of the get-in-touch tools listed below. Bon appétit!